And so as human animals we universally share the need to take care of business in a safe, relatively dignified place, right? So whatever you think about transgender people, we can all start there. And I think that’s where the Michigan school board did start when it was tasked with developing some volunteer guidelines to ensure a place for all children to take care of business. Now many people have legitimate concerns about how, functionally, that is going to happen and the effects it might have on them and their children. Yes, of course. Let’s talk about that. Let’s learn more. Let’s figure it out. But let’s keep in mind the overarching goals (safety, dignity) and avoid reactionary legislation, such as a bill Senator Tom Casperson is planning to introduce. As North Carolina has demonstrated, it would just make matters worse. 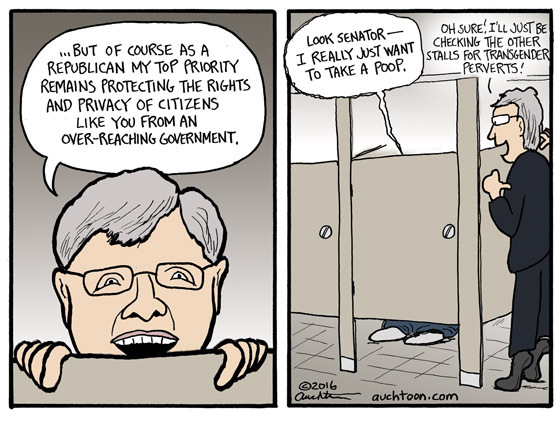 Everyone poops, Senator. But nobody has to be a poop. Safety, dignity, and I like to hope for cleanliness. I agree with all that you’ve said and would like to add that just as everyone eliminates waste, we also try our best to avoid having to use a public restroom in the first place. Please don’t let Arlan see this cartoon. After all, he might get the idea of checking out the stalls in every bathroom he enters. Of course, he will need a -stool- to stand on!